The other day I was filling out a rebate form and it got me thinking. Rebates are a great way for companies to make people believe that they are getting a deal on a product. The reality from what I’ve read, is that most people don’t bother filling out rebate forms or fill them out incorrectly and don’t receive the rebate thereby making rebates just a marketing gimmick. Years ago, the minority of people that received rebates got checks that they could deposit. At some point, companies decided to switch to prepaid gift cards that are more difficult to redeem. 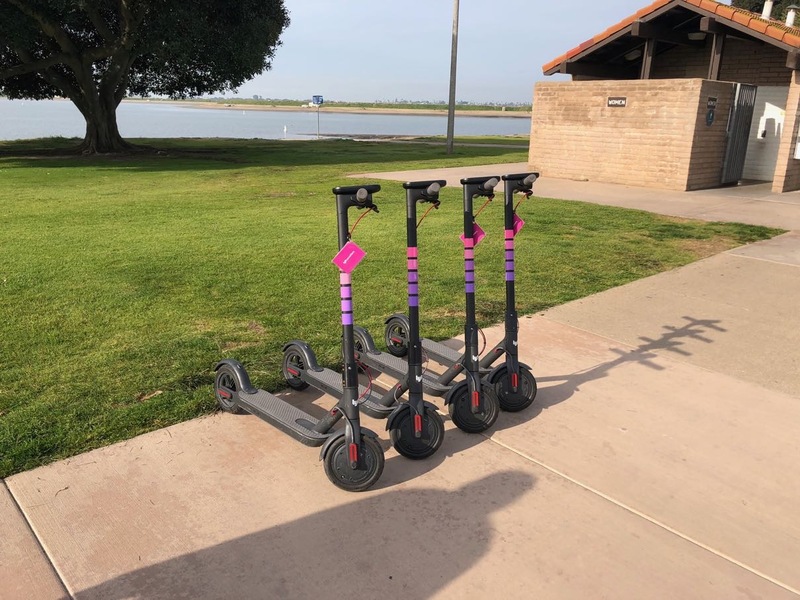 The gift cards expire within a few months and it is hard to use up the last few dollars of the cards since many vendors don’t do split payments across multiple payment types. After thinking about this for awhile (yes, I think about strange things), I came up with what I consider a brilliant solution. As a frequent Amazon shopper, I figured that I could just buy an Amazon gift card and apply it to my account. Amazon lets you purchase a gift card in any amount (not sure if it is whole dollars only) and then have it sent to yourself. Apply it to your account, it doesn’t expire, and there is no need to worry about spending the last bit of the card. Next time you get one of those prepaid gift cards, go ahead and buy an Amazon gift card and either send it to me or apply it to your account! You’ll thank me for not having to deal with that piece of plastic for more than a few minutes. One of the lazy things that I’ve tried to do was have the Amazon Echo turn my TV on and off. When I had Home Assistant running on my Raspberry Pi, I used a component that controlled the TV and Apple TV via HDMI CEC. Unfortunately it wasn’t quite reliable and I lost the ability to use it when I migrated to a VM for Home Assistant. In a recent release of Home Assistant, support was added for Roku and since I have a TCL Roku TV, I decided to give it a try. The component itself works, but has a few major limitations for me. First off it initializes on Home Assistant startup. In order to conserve a little energy, I have my TV, Apple TV, and sound bar on a Z-Wave controlled outlet. The outlet doesn’t turn on until the afternoon, so most of the time when Home Assistant restarts (I have it restart at 6 am so that my audio distribution units initialize as they also turn off at night), the TV isn’t turned on. The second issue has to do with the TV going to sleep. It has a deep sleep and a fast start mode; fast start uses more energy, so I leave it off. The Roku component uses HTTP commands to control the device or TV; when the TV is in deep sleep, it doesn’t respond to HTTP commands. This, of course, makes it impossible to turn on the TV with the component. After thinking about this problem for awhile, I came up with some Node-RED flows to turn on the TV and handle status updates. The TV, it turns out, responds to a Wake-On-LAN packet as I have it connected via Ethernet and Home Assistant has a WOL component that lets me send the packet. My flow to check on the TV state is a bit complicated. First it pings the TV. The ping is done every 10 seconds. If the TV responds, it sends an HTTP request to the TV. When the response comes back, it is parsed, the current application running is checked. This also lets me know what Roku channel is currently active. I have noticed that my TV reports that the Davinci Channel is active when I turn the TV off, so I special case that. If the channel is not null and not the Davinci Channel, I then send a command to check to see if the display is off. After I figure out the app and if the display is off, I craft a new payload with the current channel in it. If the TV doesn’t respond to the ping, I set the payload to off and then send the state to the Home Assistant API. Turning on the TV is a bit less complicated. Send WOL packet to TV. Send HTTP command to turn on TV. Send HTTP command to set input to HDMI3 (my Apple TV). Turning off the TV is even easier. Send HTTP command to turn off TV. When I turn on the TV outlet, the state of the TV gets updated pretty quickly as the ping command from above is running every 10 seconds. 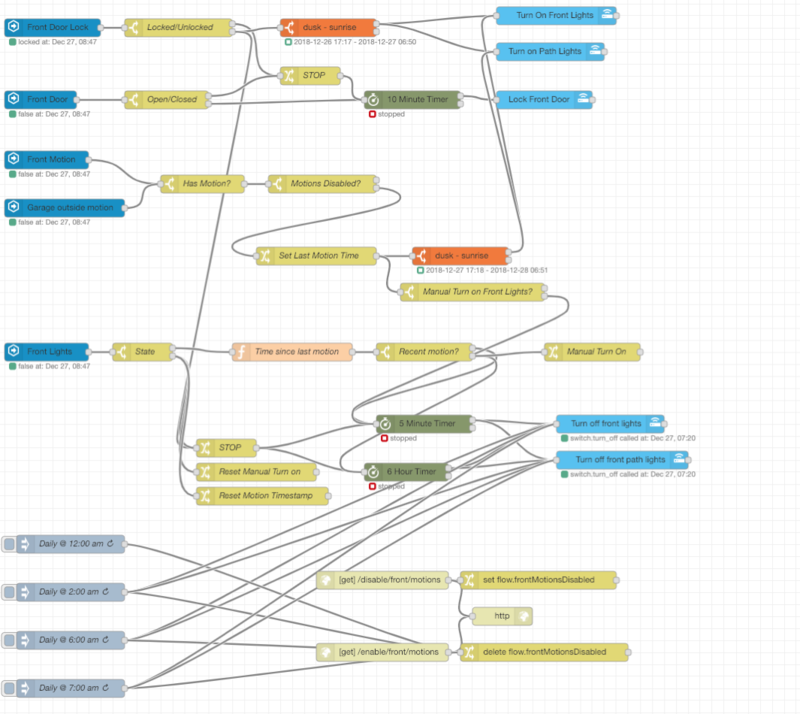 I’ve posted the Node-RED flows below that can be imported and modified for your situation. I’ve been so pleased with Home Assistant that I decided to see if I could migrate completely away from Vera and run all my Z-Wave devices on Home Assistant. 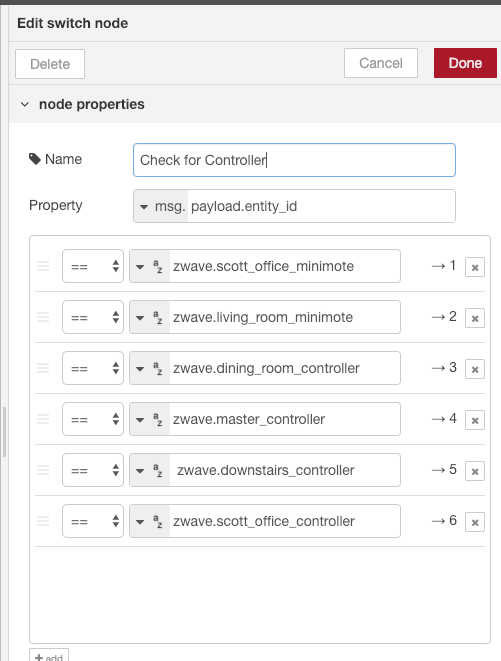 Currently Home Assistant uses OpenZwave as the base and has basic support for a lot of Z-Wave devices. While OpenZwave isn’t as mature as Vera in its implementation, I found that with the exception of 4 Leviton VRCZ4-M0Z zone controllers, everything worked well. I’ve read that some people have had problems with Z-Wave on Home Assistant, but so far things have been going quite well for me using an Aeotec Z-Stick Gen5 as the controller. I suspect that my success is due to the type of devices I have (only outlets, switches, 1 light bulb, 2 portable MiniMote controllers and these VRCZ4s); I don’t have any sensors and only 2 of my devices are battery powered. In order to complete my transition away from Vera, I had to get the 4 VRCZ4s to work. A Google search turned up very little information on how to do this with the exception of one post that gave me some clues. The post uses a third party piece of software that I don’t have to program the controllers, so that was pretty much out. However, the post did talk about the SCENE_CONTROLLER_CONF Z-Wave command class. With this information in hand, I decided to see if I could program my controllers. Here’s what I eventually did. Sign up for a developer account on Silicon Labs. Reset the VRCZ4 by pressing and holding the left side of buttons 1 & 3 until it blinks amber and then remains a solid red. Press left side of buttons 1 & 3 of the VRCZ4. Wait until node is added. I like to look the the OZW_Log.txt to check status. The node will say Complete next to it when it is done. 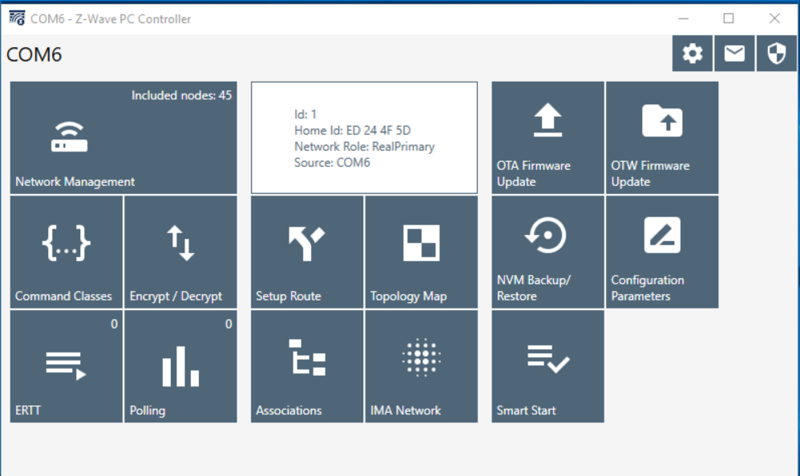 Select node in Z-Wave config called Leviton VRCZ4-M0Z. Make a note of the node number. Rename Entity by going to Node Information, selecting the gear and entering a new node. 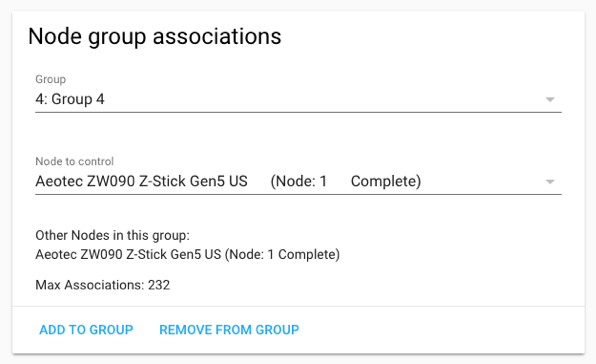 Make sure Aeotec Z-Stick (node 1) is selected and click Add to Group. Repeat the above 2 steps for Groups 2-4. 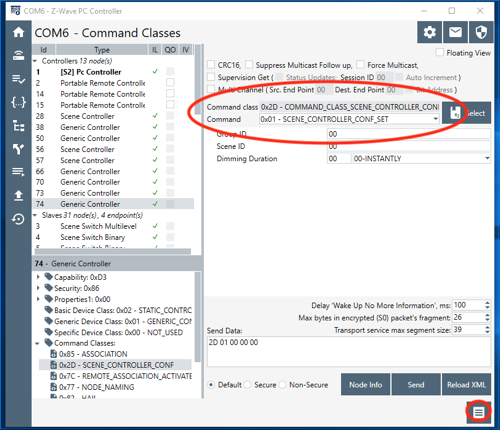 The VRCZ4 needs to know where to send commands when the buttons are pressed. If you have other devices you want to control such as lights or outlets and they support Z-Wave association, associate the devices with the VRCZ4 now. Groups 1-4 corresponds with buttons 1-4. So if you want button 1 to control an outlet, associate it with the outlet. If all the buttons on the VRCZ4 are going to be associated with other devices, you can stop here as the associations will cause the buttons to turn on/off the associated devices. You can even associate more than 1 device to a button (i.e. 2 backyard lights). 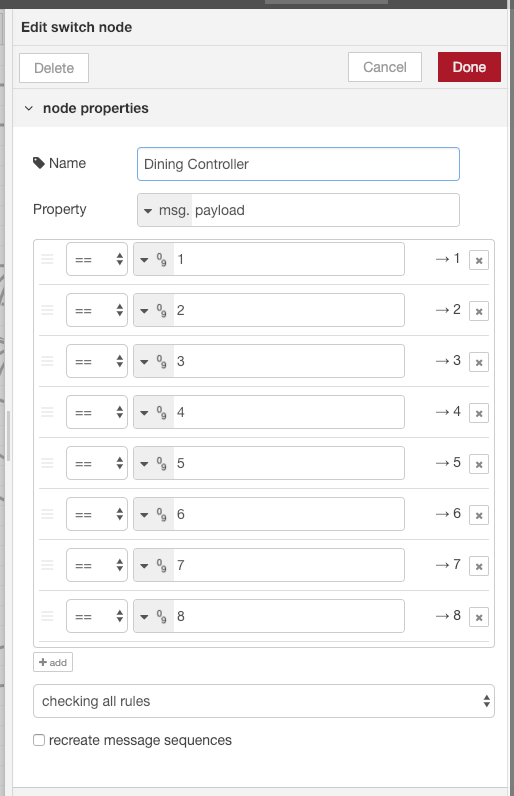 If you want of the buttons to control scripts or automations on Home Assistant, you’ll have to do some more steps. Shutdown the HA box (not just HA, but the entire box). Connect Aeotec Z-Stick to computer with Z-Wave PC Controller software. Locate node of controller on left side. Click on it and then click Node Info. Double click SCENE_CONTROLLER_CONF in the lower left. Click the button in the lower right to show the log. At this point, you need to program each button where you are not using associations to control devices. For each group ID, assign a scene ID and click send. You’ll see some message in the logs. 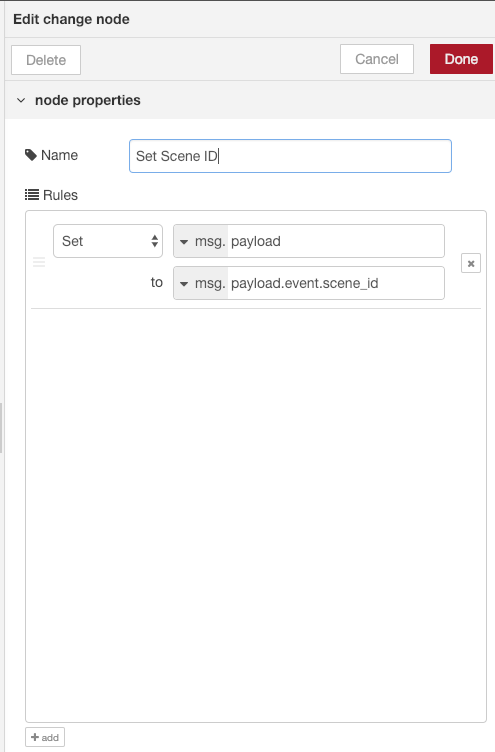 To verify that the scene IDs are set, press a button and in the log you will see a SCENE_ACTIVATION_SET message with the scene ID. Note that the group IDs and the scene IDs are in hex. Since I’m only using 1-8, it doesn’t matter but if you use different scene IDs, be aware of this. Repeat for each button you want to set. Unplug the Aeotec Stick from the computer and plug it back into HA and reboot HA. The programming has now been done, so the next step is to use the new commands in Home Assistant. 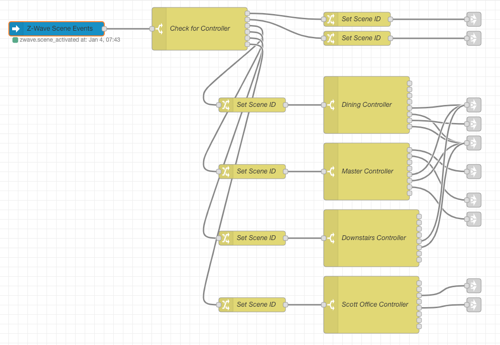 I use Node-RED and have setup a sequence that handles all of my controllers. 1. 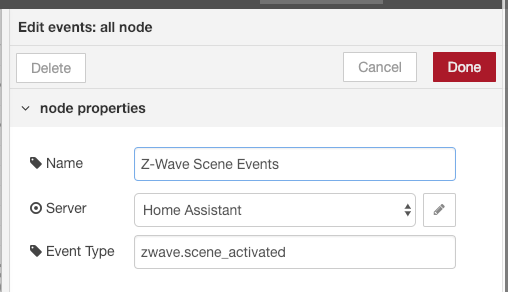 Drag an events node (top left in Home Assistant) to the workspace and set it up to only look at zwave.scene_activated events. 2. 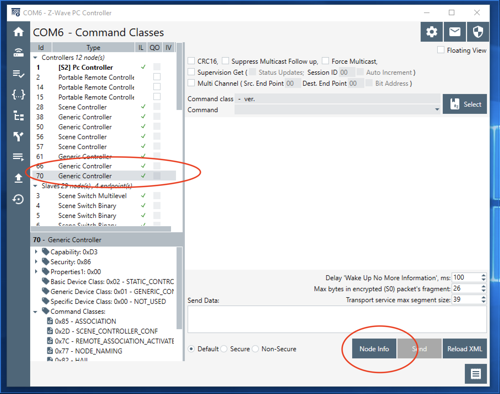 Use a switch node to differentiate between the controllers. 3. Use a change node to extract the scene ID. 4. Next use a switch node to separate out the scenes. If you didn’t follow my scene numbering, you will have to enter whatever scene IDs you used. 5. 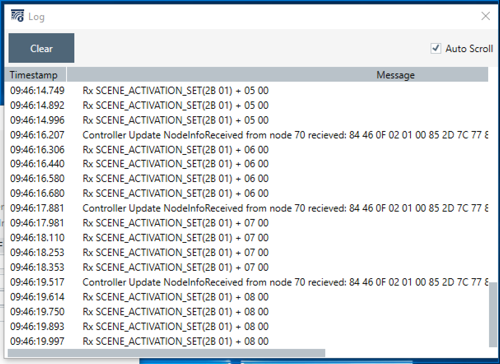 Connect up nodes for each scene. While this seems like a lot of work, I probably took longer for me to write this up then to actually configure a controller! I’m not an expert in Home Assistant, Node-RED or Z-Wave so send feedback if you have any. Auto Layout is an amazing concept for developing iOS apps as it allows for an application to more easily look good across different devices. In addition it makes using dynamic type so much easier; as someone that wears glasses I always increase the type size on my devices and when apps don’t take advantage of it, I get kind of annoyed. So when I develop apps, I try to use dynamic type and using auto layout makes things so much easier. A common theme in apps I develop is to have a UITableView with a bunch of rows. The rows have different bits of text and the only sensible way to develop this is using auto layout. With the latest releases of iOS, a lot of code dealing with dynamic type, heights of cells, responding to device changes, etc. has been eliminated. However, there are still a few gotchas in making an app with a UITableView that behaves properly. I’m going to go over the steps I used (and provide sample code) for how I handle this. I had a few requirements that make my implementation a little different than other tutorials on the web. Each cell has an image that would be at most 1/3 the width of the screen. The image must touch the top and bottom of the row. The image had to be at least a certain height. Images are loaded asynchronously from the Internet. Next to the image is up to 5 lines of text pinned to the top. Next to the image is 1 line of text pinned to the bottom. Each line of text could wrap to multiple lines. Increasing the type sized must resize the rows. The cell must have a minimum height. Rotating the device must work. Writing that out sure looks more complicated than it was in my head! I’m not going to go over the initial project setup, but will jump right into Interface Builder after I created a UITableViewCell with xib. Note that I don’t use Storyboards and opt to create a separate xib for each view controller and each cell; Storyboards tend to bite me each time I use them as I like to re-use code as much as possible and by default the Storyboard for a UITableViewController puts the cell in the Storyboard making it harder to manage. I’m sure some would argue with me that Storyboards are great, but they just don’t work for me. 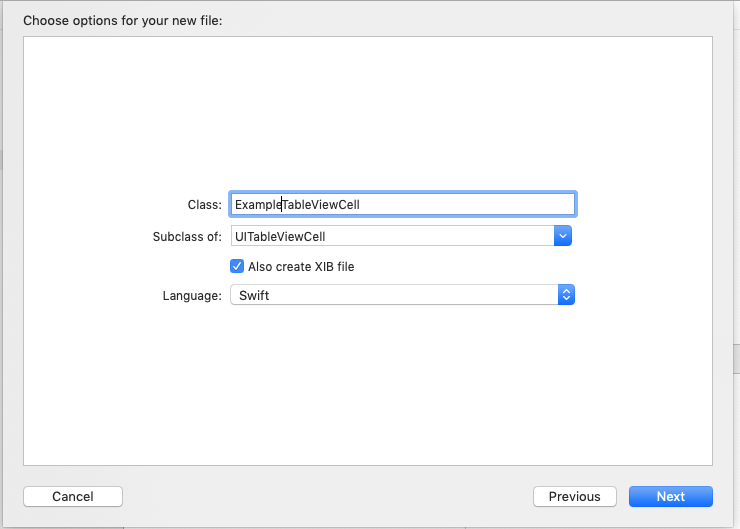 Create a new UITableViewCell with a xib. In the xib, add a UIImageView to the left side that is pinned to the left, top, and bottom of the cell. Set the UIImageView to Aspect Fill and Clip to bounds. Add a vertical stack view pinned to 10 pixels from the UIImageView, pinned to 10 pixels from the top and 10 pixels from the right. Add 5 UILabels to the stack view. Each label should be set for “Automatically adjusts font” and a Font of Body. Set 1 or more of the labels to have 0 Lines so that it grows vertically. Also, set auto shrink to minimum font scale of 0.5. Add another vertical stack view pinned to the leading of the first stack view, 10 pixels from the right and bottom of the container and on the top to be >= 5 from the other stack view. Add a UILabel to this stack view. Set the font as above. Set the height constraint of the UIImageView to a priority of 250 (low). Add a UIActivityIndicator that is centered on the UIImageView (set the constraints). Create a UIImageView subclass that looks like this. The UIImageView uses the intrinsic size of the image in the absence of other constraints and we want more control of the height of the view. Change the UIImageView class to ExampleImageView. Connect outlets for the 6 UILabels, the UIImageView (with the new class), the activity indicator and the height and width constraints on the UIImageView. Time to move into the source of the table view cell. I’m only going to cover the interesting parts here. See my example repo at for the full example. Setup a variable for the cell width. This is going to be set through the view controller so that rotation changes can change the width of the image. Add a method for setting the image width. Next in the view controller, add the following to handle the change in width of the cell. Believe it or not, I think that’s it! I’ve spent at least 4 weeks on this issue and keep running into some problem. Rotation and changing font sizes (Accessibility Inspector is great for testing) kept bringing up issues. The example repo can be found here: https://github.com/sgruby/TableViewExample. Feedback/changes are welcome! I’m sure I’m not doing something correct or there is an easier way; I just haven’t figured it out, yet. Home Assistant and Node-RED, automation perfected? Earlier this year I started experimenting with Home Assistant and wrote some thoughts about it. It brought together enough pieces that I keep tinkering with it. A friend of mine had mentioned a project called Node-RED which is supposed to more easily link together IoT components and perform actions based on different inputs. At the time, I brushed it off as I didn’t want to bother figuring out how to install it. Fast forward to last week when I noticed that Home Assistant had a Node-RED add-on. Installing the add-on was quite easy and I was presented with a blank canvas. After a few minutes, I figured out how to make a simple sequence that took the state of a door sensor (at the time connected via my Vera) and turned on a light. Nothing too fancy, but I was able to hook it up, hit Deploy and test. It worked! This was light years ahead of the YAML based automations in Home Assistant and much faster to setup than Vera. I was hooked almost immediately. Could I convert all my automation logic to this? I spent the next few days trying. Wiring some basic automations was quite easy as in this example that turns off lights in my bathroom if there is no motion. Node-RED resets the timer if there is more motion, making the sequence very straightforward. Unfortunately not all my automations are this simple. The most important sequences deal with my front and back motion sensors. I could just use something like the above sequence, but I only want the lights on at night, I want to be able to disable the motion sensors (for example on Halloween if we’re not home, I don’t want lights coming on), and if I turn on the lights manually I don’t want them turning off a few minutes after there is motion. The tricky part here was to determine if the lights were manually turned on or triggered by a motion sensor. After a bit of experimenting, I decided to record the last time there was motion into a variable. Then when the lights turn on I check the variable to see how long ago it occurred. If it was less than 30 seconds ago, call it triggered my motion. With that, I was able to set on off timer based on how the lights came on. The one bit of “code” I had to write was to determine how long ago the motion was tripped. The flow may look complicated, but to me it is quite readable. The visual aspect of Node-RED makes it easier to setup automations, but calling automation simple is far from the truth as I’ve shown above. As a professional software developer, writing code doesn’t scare me but for a hobby, this visual approach (with a little code as necessary) is much nicer. When I come back to this in 6 months, I have no doubt that I can read what is going on and troubleshoot as necessary. For the last 5 years, I’ve been using my Vera to control everything using a plugin called PLEG which stands for Program Logic Event Generator. It has worked quite well, but it has been so long since I setup most of the automations, I have no idea what I did. PLEG, while functional, was a bit difficult for me to wrap my head around and it pained me every time I had to touch it. Also, when I touched it, I seem to recall having to restart Vera and wait only to find out that I needed to change something. I’m so impressed with Node-RED that I’ve decided to see if I can move all my Z-Wave devices to Home Assistant using an Aeotec Z-Stick Gen5 plugged into the Home Assistant. The goal with this move is to speed up messaging; right now the Home Assistant polls (I think) Vera all the time looking for changes. This isn’t very efficient and pressing a button can take a second or two to have the message reach Home Assistant. Will this work? I hope so! I know that I’m just scratching the surface with this, but I am very excited over the prospects! This past summer my family took a cruise on Carnival Cruise Lines to the Eastern Caribbean. There were a total of 17 of us and we had a good time. One of the suggested ways for everyone to stay in touch was to use the Carnival Hub App which is basically their goto app for up to date information on the ship which has a messaging component. For $5 per device for the cruise, it didn’t seem all that unreasonable except that just about everything on the cruise costs extra! The chat app, like most chat apps, has push notifications. In iOS, there are 2 types of push notifications, local and remote. The remote ones require a persistent connection to Apple’s Push Notification Service (APNS). 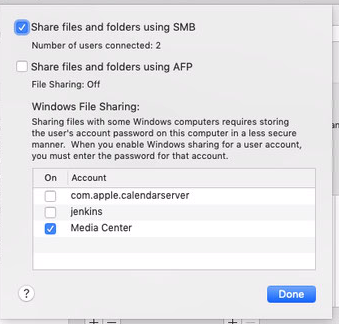 I suspected that the app used local notifications and stayed open in the background as having several thousand devices connected to either Apple or Google’s push servers over a satellite link would not make much sense. So I pulled out my trusty copy of Charles Proxy and decided to see what traffic was being sent. What I saw just about shocked me. Connections using the app were NOT using SSL! Since the WiFi was unprotected (it would be cumbersome to give out the WiFI password to so many users), anyone with rudimentary hardware/software could sniff all the traffic. SSL certificates are cheap and easy to deploy, so there is no excuse for every service not to be using them (I use them internally on all services running at my house). Is it so bad that the app isn’t using SSL as no credit card data is flowing through the app? Absolutely! People could be chatting about which rooms they are in and when they are going to meet giving criminals information about when to go into their rooms. People could also tell their friends/family what they have in their rooms making them targets for criminals (“I put the laptop/camera under the bed”, for example). Not only was chat not SSL protected, all other aspects of the app’s communication were sent in clear text. This request has my Folio number and name; those 2 pieces of information could allow anyone to charge to my room. While they should look at the ship ID (you are given basically a name badge that is your room key and used for purchases), I don’t know if the staff always looked at them. My cabin number was also in the request. Want to know what my room charges were? It appears that the chat application was using the Jabber protocol (XMPP) running on port 5222 (non SSL port). I only grabbed a little of the traffic, but the XMPP protocol would have all the chat conversations appearing in it. The security of the app wasn’t the only issue in using it. I suspect that the WiFi was also overloaded; with something like 6000 people on the ship, there were several thousand devices connected at all times even if they weren’t communicating at the same time. This made using the app very frustrating; messages didn’t get through and notifications were delayed, if they were received at all. Imagine all the people annoyed that his or her significant other wouldn’t respond even though he or she actually did. I stopped relying on the app in the first few hours of using it! Deploy a wildcard SSL certificate that is issued by a major SSL vendor (no self-signed certificates) to each internal server on each ship. Add more WiFi capacity to every ship. Perform load testing of the apps (iOS and Android). Perform load testing of the WiFi network. While the concept of being able to communicate with others on a cruise especially if you have a large party is great, Carnival’s implementation needs work. In the future, I’m inclined to bring FRS radios; they definitely won’t work everywhere, but could be more reliable in certain situations. Also, meeting your group each morning and going over plans even if people go their separate ways (like people did before technology!) might also be in the cards. If Carnival wants to get in touch with me about these issues or wants help with the app, I’m available!